Good Morning Green Panda Friends. It’s time for another post in the Green Panda Credit Card Management Series. We have already discussed whether credit cards are a good idea for young adults, as well as the best solutions to pay off credit card debt. Today we are going to start to review different credit cards available on the financial market. These are not credit cards that we recommend; they are just good credit cards that have unique rewards programs. Good credit cards offer good rewards programs with low interest rates and little or no annual fee. The first card that we are reviewing is the TD Payment Plus Visa Credit Card. The TD Payment Plus Visa Card is a good credit card because the more we pay the more we save. This credit card offers a good rewards program that offers savings every single time we make a payment to our VISA card bill. TD Bank is “America’s Most Convenient Bank”. 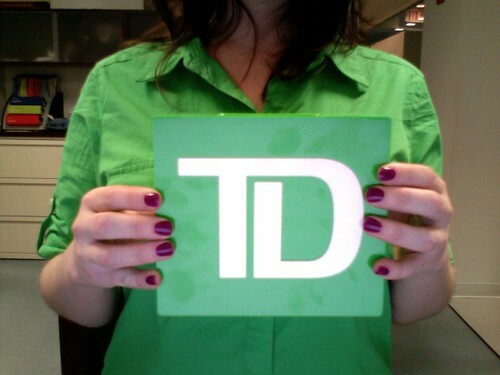 It is the American affiliate of the major Canadian financial institution TD Canada Trust. If we pay 5% to 9.99% of our current monthly balance we receive 25% of the month’s interest charges in the form of a statement credit. If we pay 10% of our current monthly balance we will receive a statement credit equal to 50% of the month’s interest charges. This is a good rewards program because it is unique. It is similar to a cash back rewards program except that our statement credit is based on our payments, and not on our spending. With traditional cash back rewards programs the cash back statement credit is usually paid out once a year. However with the TD Payment Plus Visa Card the statement credit is paid out monthly at the time we make our payment. The TD Payment Plus Visa Card is a good credit card for young spenders and young savers because it helps us pay off our credit card bill every month. The more we pay on our monthly bill, the more we save and earn in the form of a cash back statement credit. There is no annual fee for the TD Payment Plus Visa Card. This means added savings, and no annual fee. The TD Payment Plus Visa Card is currently offering 0% APR interest rate on balance transfers for 6 months.